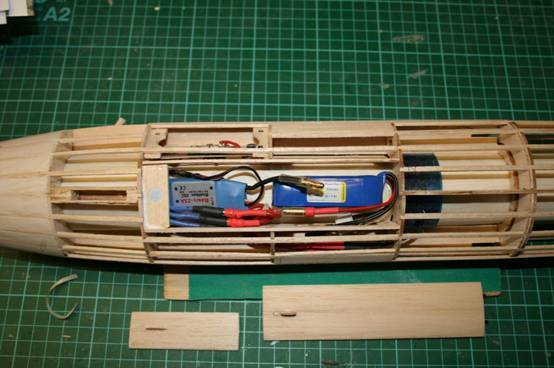 Chapter 2 : Build of a 143% Steve Bage MIG17 Inlet/Outlet ducting, fan installation and electronics. 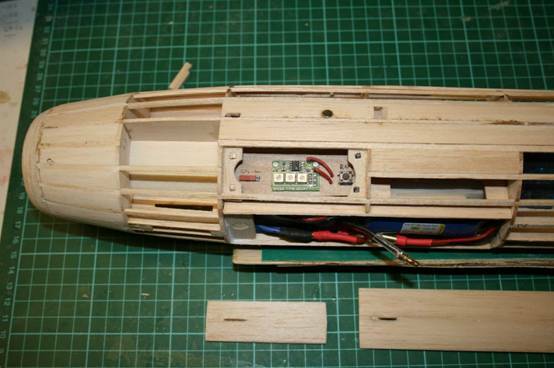 Introduction : Chapter 1 of the build showed assembly of the balsa components. This article shows how the inlet and outlet ducts were fabricated and installation of the power units and controller. Inlet and outlet ducts : Steve’s original used paper ducts which I was not keen on. A colleagues EDF model flown in damp weather ‘bubbled’ its ducts due to water absorption. At the inlet, the high air velocity leads to a decrease in static pressure (Bernouilli) and as water vapour dissolves out it is absorbed by the paper leading to damage and distortion of the paper ducts. I searched the workshop for suitable formers, 45mm for the inlet and 36mm for the outlet and found nothing. 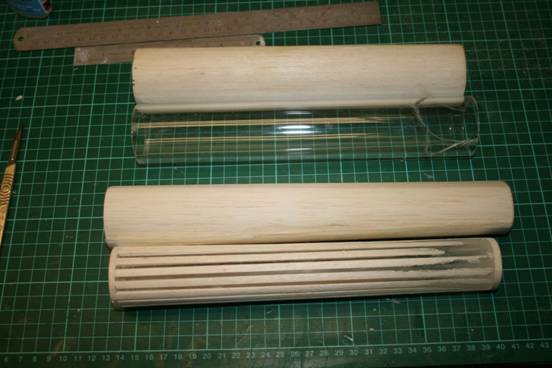 Eventually I used acrylic tube from clear plastic supplies. My first attempt was to sneak some baking parchment from the Domestic Controller and wrap the formers with this using Magic tape. I then wrapped wetted Gummed Brown Paper of the type used by picture framers, around the former. After 24hrs drying the duct was removed. Alas the duct failed in buckling as I struggled to push fit it into the fuselage. Now if the former had been 0.5mm smaller or if I had sanded the formers, I might have stood a chance. As it was, I abandoned Gummed Brown Paper and used conventional techniques of well sanded 1/32” 6lb/ft^3 balsa with tissue/doped x 3 interior for damp proofing. These came out at 5.1gm and 6gm outlet/inlet which is not unacceptable bearing in mind that a sheet of A4 printer paper is 5gm. The ducts are shown below next to their formers. Note that the outlet (lower) duct is tapered. The 36mm acrylic former is shown with tapered balsa packers to achieve a 44/36mm taper. The observant will notice that the inlet former is cracked on the right edge. The EDF blew it off the bench on test despite there being a 5’ separation, but it glued together OK. Moral : Do not work messy…easily said but not easy to achieve. EDF tests : These were repeated with the intent battery, a 550 mah 25C Hyperion G3 from Robotbirds. Allegedly capable of 13.7amps. Current draw was initially 13.2 amps, dropping to 12.3 amps steady after 10s. This data is similar to the tests run in Chapter 1. I admit that I turned the kpaero controller down to just over 10 amps as the thrust I judged to be more than adequate…..time will tell. I am very impressed with this EDF unit. Buy here and dead cheap but Taiwan supplier, delivery in less than 10 days. I cannot fault this transaction. Performance claims…a tad extravagant but not that far off. EDF installation: I installed the outlet duct using CA tacking with dilute PVA grouting applied with a paint brush. The EDF went in with CA tacks and UHU Por fillets (a touch of compliance to absorb stray motor vibration). The inlet duct was installed as the outlet duct. I added a tissue/dope reinforcement to the underside of the inlet duct at the battery/controller section. The structure appears to be super stiff. I cannot imagine that the fuselage structure will fail. The stringering was completed as shown below. If the EDF needs attention, major surgery will be necessary as the power unit is not serviceable. I still have the option of separation at F7 but will need a motor failure before I get the panel saw out. With hindsight, I would probably instal the balsa formers much earlier and before stringering as some sanding of the former inside diameters was necessary for a snug sliding fit. I felt it prudent to use 3.5mm connectors as I could not rule out having to use a 3 cell battery. Now these were bulky so the battery and ESC load as below in the intent space . Hatch retention is via magnet. The kpaero E30 flight controller loads to a bay created underwing, again with magnet hatch retention. The left hand slide switch connects battery to controller and the right hand push switch starts the timed motor run. Both switches are sub micro as they only have to cope with the current load of the kpaero controller believed to be less than 10ma. On model retrieval, I have to switch off the controller on the slider, leaving the 3.5mm battery plugs connected. After the last flight of the day, move the slider to the off position and disconnect one or both 3.5mm battery plugs and remove the battery for storage. 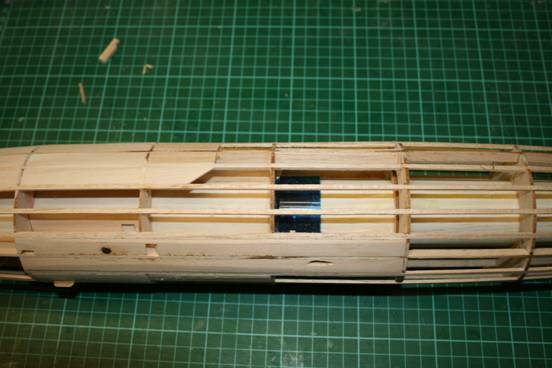 Note that I have added 1/16” balsa infill just under the wing in the region where the model is gripped for launch. A quick run up before lunch confirmed that I had connected the ESC motor correctly and had not messed up the switch soldering. I need to do a few hours more sanding and filling, then covering and finish.